Edinburgh Monarchs marked their 500th speedway meeting at Armadale last night with some degree of pomp, and an easy-street performance against Plymouth Devils who were left short handed when some of their team were delayed reaching the stadium. Monarchs, still smarting from their surprise reverse at Redcar Bears on Thursday, swamped the unlucky Devils 64-28 and are now level on points with Somerset Rebels at the top of the Premier League. It was a Monarchs squad robbed of their own identity who took to the track with three regulars missing. Sam Masters and Kevin Wolbert were en route to their Grand Prix semi-finals in Italy and Latvia, and Rob Branford remained sidelined with an injury to his shoulder. Monarchs drafted in Scunthorpe’s Theo Pijper and Glasgow racer Nick Morris as guests, the latter being a very contentious choice with some Monarchs supporters who are yet to forgive the Aussie for the crash which ended Hungarian favourite Joszef Tabaka’s career, for now, with the Capital club in 2013. But Morris is a World Cup rider who has been in fine form so far this season and was a sensible stand-in selection by the Monarchs management. The match was delayed by 45 minutes due to the late arrival by some of the Plymouth side caused by an accident on a motorway earlier in the day. But Monarchs were not slow out of the lane in the first heat when German ace Erik Riss and Morris grabbed a 5-1 against Plymouth No.1 Kyle Newman and young Jack Holder, which was just the start the home side were looking for. And it got better in the very next race when Max Clegg and Riss combined to take maximum points from Zdenek Simota and Liam Carr to give Monarchs an early and encouraging lead of eight points. 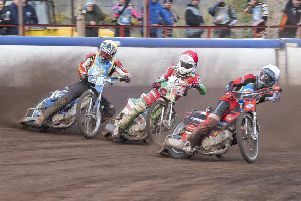 Two of Plymouth’s top riders, Ryan Fisher and Morten Risager, still had not made it to the Lothian Arena after the first five races and, as a consequence, their rides had to be covered by reserves, and in some instances Plymouth were forced to go with just one rider in opposition. This turned the meeting on it’s head as Monarchs simply took the gift and piled up the points at will. Monarchs led 25-11 after six races and in truth the meeting ceased to become a true contest. Risager finally made it for his second outing in heat seven but finished last behind Craig Cook who equalled the track record on his way to the chequered flag. With Riss, who was making hay at reserve, following Cook home for Monarchs’ fourth 5-1 of the meeting the Premier League points were virtually assured at this stage. Plymouth gave Holder a tactical ride in heat eight and he doubled his points by finishing second behind Monarchs’ race winner Justin Sedgmen. Simota came home in third place giving Plymouth a 5-3 advantage, but the home team were still cruising 33-17 and there was little the Devils could do about it under the circumstances. Fisher arrived for his first ride in heat nine and claimed third place as Pijper and Sedgmen rattled up another Monarchs 5-1 to lead 38-18. Monarchs kept their foot on the pedal and were relentless as they steamed in front 51-23 with just three races remaining. The only question being was would Monarchs smash through the barrier of 60 points. They did with ease. The undoubted star for Monarchs was Riss who bagged 15 points from his six rides which included three race wins. Monarchs: Riss 15, Cook 14, Sedgmen 13, Morris 10, Pijper 6, Clegg 6. Plymouth: Holder 11, Simota 7, Newman 5, Risager 2, Kurtz 2, Fisher 1, Carr 0.